Almost two years since I sat down to outline my “throwaway” idea for a Flash Gordon-esque serial, Glitch Mitchell and the Unseen Planet, is finally available. A gateway to another world. A lucky contest winner. An adventure across the cosmos! Dwayne “Glitch” Mitchell has always been obsessed with space. When he learns that NASA has discovered an alien gateway, he’s the first to enter a contest to see the incredible phenomenon. Glitch wins and he travels deep within the Colorado Rockies to get a peek. He’s in awe, but he’s also in danger. As project head Dr. Zheng discusses the gateway, an armed man calling himself John Smith takes Zheng hostage and causes an explosion. When the rubble clears, Glitch is alive but trapped with Air Force Captain Scarlett Anderson on the other side of the gateway! Far from home on an alien world, Glitch and Anderson must find Zheng before the planet’s inhabitants can eat, crush, drown, or execute them. Even if they can escape in one piece, will they still have a home to come back to? 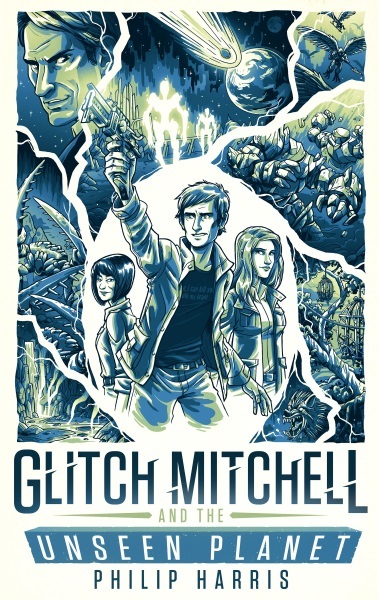 Glitch Mitchell and the Unseen Planet is a sci-fi adventure that features exotic alien worlds and fast-paced suspense. If you liked the wild adventures of Flash Gordon, you’ll love this thrill-ride throughout the universe! The book is available on all ebook platforms including Amazon US, Amazon UK, Amazon Canada, Kobo, Nook and iBooks. The print edition will follow shortly. For a limited time, the ebook is on sale for 99c/99p so if you’re interested in reading a slice of action-packed old school science fiction, now is the time to pick it up.